I don’t mind having someone else make my coffee or tea for me, partially because I’m grateful not to have to do the work myself, but primarily because I generally take my coffee and tea black. It’s hard to make coffee or tea when someone simply says they want “milk and sugar.” There really aren’t any guidelines to go buy, and when these drinkers prepare their own, they go by sight – in other words, they know it’s right when they see it. Now, you can see it too. My Cuppa Tea and My Cuppa Coffee are color-matching mugs that help you determine exactly how much milk is enough when you’re making coffee or tea. Each mug has paint swatch-like color stripes around the inside, so you can simply pour milk (or add sugar) until your drink matches the color that coordinates with how you (or whoever you’re preparing a drink for) take it. The tea cup is lighter than the coffee one, naturally. 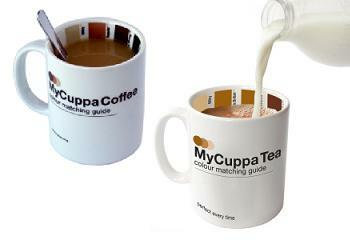 All you need to do is give it a trial run and you’ll be set up for a perfect cuppa every time.